Bar bar black sheep, have you any food? Yes sir, yes sir, three stalls full! One for the Indians, one for the Thais. 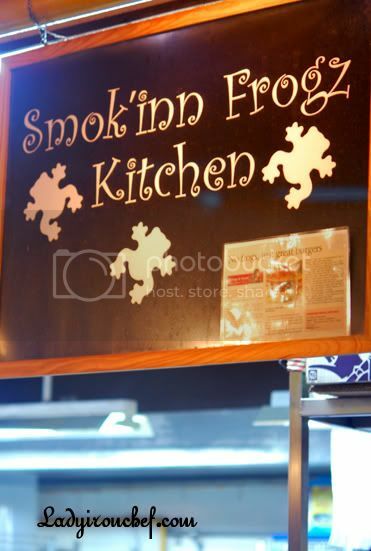 And one for the Smok’Inn Frogz kitchen by the side. The epitome of the coolest coffee shop, Bar bar black sheep. With a foot in uptown Bukit Timah, the affluent neighbours and the Caucasians crowd, the rise in the popularity isn’t merely luck. 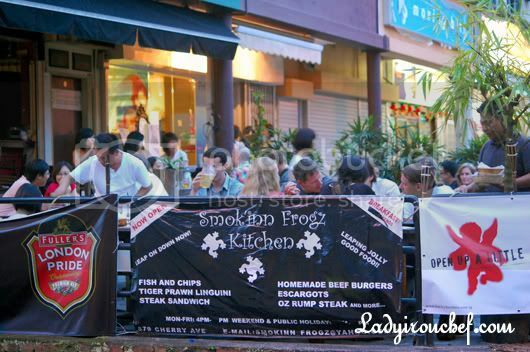 The owner of bar bar black sheep is a pretty smart guy, bringing in an Indian, a Thai food stall and of course Smok’Inn Frogz Kitchen. With such ear-catching names, who could resist coming down to find out what they are about? Essentially a coffee shop that goes through project makeover, the dim lighting, the laid-back environment, with plenty of boozes, and popular food. Smok’Inn Frogz Kitchen is co-owned by three partners, with the former-chef from Flute @ the Fort coming out with the menu, the second guy managing the finance, and the third dude handling the daily operations. The de facto signboard for Smok’Inn Frogz, the homemade beef burger ($12) was made popular after the Sunday Times reporter came to try the burger and raved about it. Like they said, the rest was history. Well I was tempted to choose between the chicken or the beef burger, but since they were both priced the same, it didn’t really make sense to choose chicken over beef. Now back to the main character, the beef patty was tender and moist, while the sesame bun was slightly too toasted for my liking. 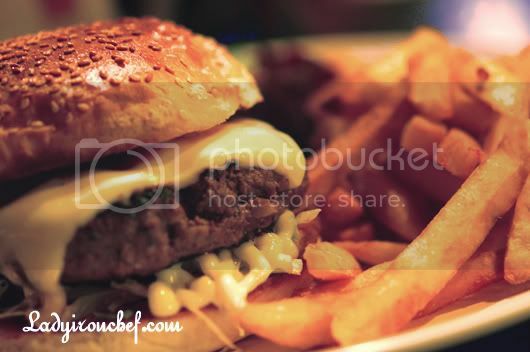 Double cheese and caramelised onions were on hand to enhance the flavour of the burger. 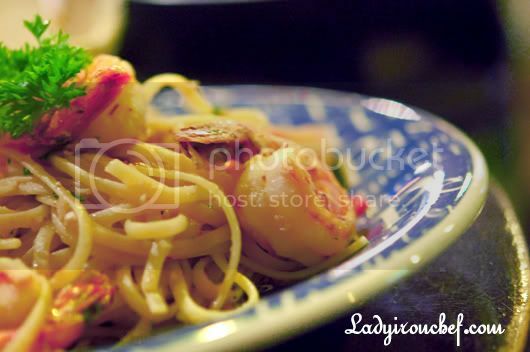 I wasn’t very fond of aglio olio since i always found them to be too spicy and dry. The Prawns linguine Aglio Olio ($14) here wasn’t as spicy like most, as they swapped the small chilli padi with the hot ones instead. Smok’Inn frog rendition was reasonably wet, and had 6 prawns, very generous indeed. 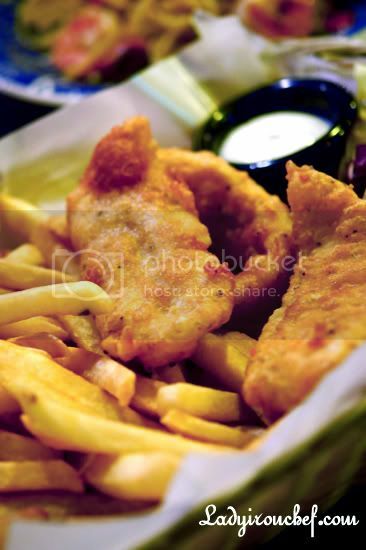 Another of Smok’Inn Frogz‘s supposedly signature, Beer-battered fish & chips ($12). The portions were huge, enough for two to share. The beer taste was evident in the fish, but other than that, there wasn’t any spectacular magic about it. And the fish became soggy after a while. Total bill was $38 for the 3 main course. 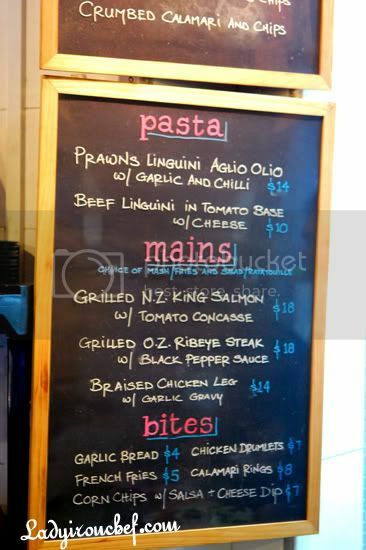 Prices are reasonable for the food, and with the Caucasian crowd and the Bukit Timah residents packing the place up, it’s difficult to get a seat for dinner on weekends if you came later than 7pm. I’ll also like to apologise for the ugly photos (the worst i took since I used dslr) due to the very dim lighting. For a Chinese version of the post, read Maureen’s review here. oh don’t worry about the photos.. this place still spells magic for me! even my bf tells me that he misses this place since we last visited. haha. love the mini rhyme you put in the front as well. farnie! Home made burger looks good ha ha does it taste juicy too? I couldn’t tell you just how much I miss the food variety in Singapore..ingenious mixture of different cuisine under one roof! Apprciate your review here and pics! This place is on my list now! adelines last blog post..Self created stir fry rice noodle concoction.. I am seriously craving a burger now and it’s only 9:30am! I’ll have to drag the hubby to that side of Singapore, sounds and looks like it will be worth it. wooah! wad can i say? 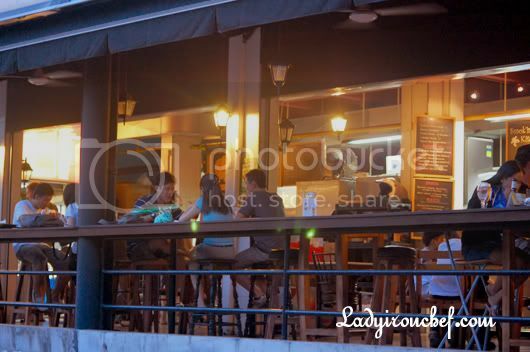 it is located in 1 of my Fave area in s’pore, nice environment, good food, reasonable price.. y Not? Actually i have been wanting to visit Bar Bar Black Sheep for quite awhile, esp since i heard rather good reviews abt this place, but just did not get a chance to.. heehee, thanks for posting this and giving me a motivation to head there! yyns last blog post..Viet Food Va Va Voom! looks like this is a must try! & yea what happened to the photos? hmm.. what settings did u use? u are done! nice intro u have got! LOL! let’s try something else next time k! the beers are quite cheap. looks like its all about concept these days.. food is almost secondary..
Ahh you finally made it there!!! I have such fond memories of this place! It’s where I took my first DSLR food photos! Love the burger too. Pity I live so far away, otherwise I will be back more often! elaines last blog post..Da Mario Pizzeria: Moving Soon! adeline: hahaha no problem, yeah when you come back to Singapore next time go eat all the food that you missed! trailingspouse: lol! so early can eat burger eh? yep do try then let me know how is it okay! maureen: hahaha yeah finally done. okay, jio me when you got craving! ratatouille: yep i heard their beers quite cheap, but we didn’t try that night. lotsofcravings: well concepts are definitely important, but if the food totally cannot make it then its quite diff to survive also. camemberu: yeah finallly! haha i saw your posts that time then got me tempted until now. lol! elaine: haha well you been to la nonna liao, its just around the area. LOL! i tried the beef burger once and loved it! i think it’s really good. best of all, i’m quite happy with the pricing for it. haha! my favouritest place for burgers and booze! Oh god. I still have no idea where this is. Hi, do they screen soccer matches there?